CartouCHe was funded by Swiss Virtual Campus. The project started in November 2004 and ended in June 2006. After a prolongation of half a year until December 2006 and a consolidation and maintenance phase of 1.5 years until July 2008, most of the content was opened to the general public. The CartouCHe content is designed as stand-alone eLearning content but nevertheless it is mainly used in blended learning mode for colloquia, discussions and exercises within the curricula of the 3 participating universities. Each of these modules are made of 5 to 10 lessons (see Module Overview). The entire course organization is modular down to the unit level, what means that the choice of content to be integrated in a course can be made on this level. This guarantees in-depth information in small learning units that can be successfully completed step-by-step, as well as guaranteeing high flexibility whereby a clear learning target is defined to the student. The smallest building block is the Unit. Units are based on the didactic ECLASS (Entry, Clarify, Look, Act, Self-Assessment, Summary) concept. This flexible framework easily allows new teaching tools such as user-controlled animation-streams or interactive tutorials. 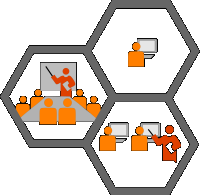 The whole course content is multimedia-based. Lecturers, tutors and students work using the web-based platforms for teaching and the respective software technologies for the exercises. The estimated time per lesson is about 1 to 1.5 hours, while each unit requires approximately 10 to 15 minutes. This time includes reading, exercises and knowledge assessment tests. The course language is English. The eLesson Markup Language (eLML) applied the didactic concept. Here, the XML-based content can be transformed with XSLT to HTML pages, including pictures, interactive examples and animations. Additionally, it can be transformed to a PDF or to a standard IMS or SCORM package for the simple integration in a Learning Management System (see eLML output formats for more information). Through the use of standards, the CartouCHe lessons can be viewed with any web browser (e.g. Firefox, Opera, Safari, Internet Explorer) on any platform (e.g. Windows, Linux, Mac). All necessary plugins for the 3D and vector graphics as well as the audio and video content are available for free.